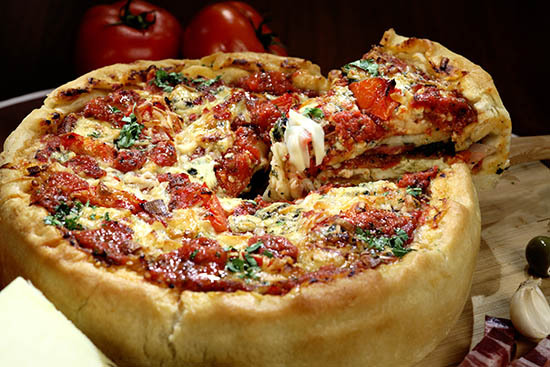 Lou Malnati’s Cheese Deep Dish isn’t your regular pizza. The legendary slice is drenched in cheese and pools of sauce, and baked in pans deeper than cake tins. Typically, diners’ faces take on a sportsman-like grimace as they tackle the last piece, filling them with more than just pizza – but a real sense of victory. A Margherita looks like a bar snack in comparison. But in Chicago, the rule is to take the standard then up it some, and this world-famous pizza is no exception. It’s easy to be awe-struck by this city. Chicago backs on to Lake Michigan which, at 307 miles long, makes any British equivalent seem like a puddle. The 108-storey Willis Tower dwarfs even The Shard. The streets are spotless, the public transport is functional. To improve sanitation, engineers made the Chicago River flow backwards. No wonder it’s often referred to as ‘the city that works’. To suggest that the Chicago design is purely functional would be a mistake, though. After the city became home to the world’s first skyscraper in 1885, it has been a mecca for architects. Even its Bloomingdale’s is housed in the Medinah Temple – a Moorish Revival building built in 1912 and replete with tiled doorways and pointed domes. The ‘Bloomingdale’s temple’ is on the 13-block-long stretch known as the Magnificent Mile where you’ll find Chanel alongside Louis Vuitton and Bvlgari. A stroll down Magnificent Mile makes for an opulent afternoon when finished with a hot fudge sundae at premium chocolatiers Ghirardelli, or a cocktail in Signature Lounge on the 96th floor of The John Hancock Tower. For those more interested in cotton candy than couture, Navy Pier is just a few blocks east. The lakefront playground has all the fun of the fair with a 45 metre Ferris wheel, mazes, boat trips and fireworks displays throughout the summer. Though the city revels in being a buzzing metropolis, it’s flanked by lakes and mountains. The first sign of snow signals an exodus to nearby pistes at Raging Buffalo or Villa Olivia. And the first sunshine of the year sees the 15 miles of sandy beaches awash with bathers. The lake is open for swimming from May to September, which are also the best months to enjoy any of Chicago’s 580 parks. 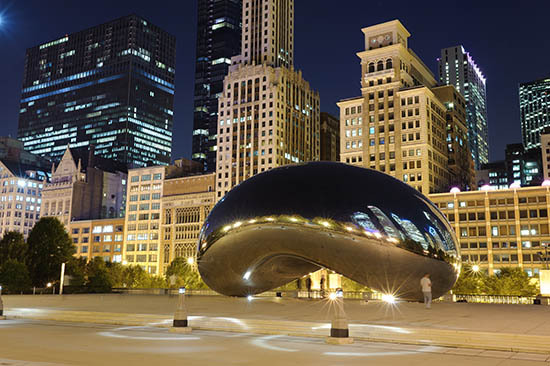 The most famous is Millennium Park – a 25 acre garden in the centre. If Chicago’s parkland isn’t quite green enough, there’s always the option to wait for St Patrick’s Day, when the Chicago River is dyed fluorescent green. Like pizza, like skyscrapers, shopping districts and urban gardens, it’s just another example of the city taking a global standard… and then stepping things up a notch. Take a bike ride along the 26 miles of Chicago’s lakefront. The city’s Divvy bike sharing system allows you to easily pick up and drop off a bike from one of the 300 stations. Buy a 24-hour pass for CAD$7 from any Divvy station and take unlimited 30 minute trips. The term ‘jazz’ was first coined in Chicago. Pay tribute to the city’s heritage by whiling away a night enjoying music or spoken word at the historic Green Mill Cocktail Lounge, where mobster Al Capone once had a booth. Sip a cocktail at the Signature Lounge on the 96th floor of The John Hancock Tower. You’re a few feet beneath the Willis Tower Skydeck, but you’ll only have to pay for your drink while enjoying stunning views of Downtown and beyond.